UPDATE: Enjoy this tour of a bedroom in our former home. We’ve moved and are giving our new-to-us home a complete remodel. I’ve completely changed my style! Click HERE to take a look. I recently realized that it’s been almost a year since I showed you my solution for the perfect nightstand in my guest room, but I’ve never shown you the rest of the room. The decorating ideas for most of my rooms are inspired by fabric and this room was no different. I’m so in love with the fabric that I used in our beach condo, that I bought enough to use on the windows in my guest room as well. It totally set the tone for this whole room. Everything else pretty much just fell into place. Gotta love it when that happens. 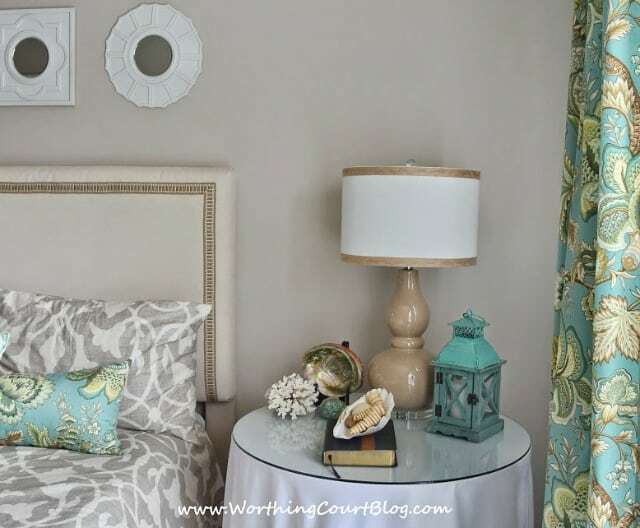 The headboard is a diy project that anyone that can use a pair of scissors, an electric knife and a staple gun can make. Just decide on the size headboard that you want, go to your local big box home improvement store and ask them to cut a piece of 3/4′ thick plywood to your specifications. Buy a piece of foam (mine is 2″ thick) from a fabric store and use an electric knife to cut the foam to the same size as the plywood. Spray the plywood with spray adhesive and apply the foam. Buy enough fabric to fit the plywood, plus several inches extra to wrap around the back. I kept mine inexpensive by using a dropcloth. Simply staple the fabric in place on the backside of the plywood. You can see from the photo that I took the cheaters way out and used 2×4’s for the legs. They’re also covered with dropcloth to help them blend in better and are just screwed to the back of the headboard. The bed frame screws into the 2×4 legs to hold it in place. Just to give the whole thing a little oomph, I hot-glued decorator trim around the perimeter. The lamp on the round table greatly benefited from adding some jute ribbon to the shade. All of the shells are from my mom’s collection. This room is long and narrow, so it was a little tricky to arrange furniture in. 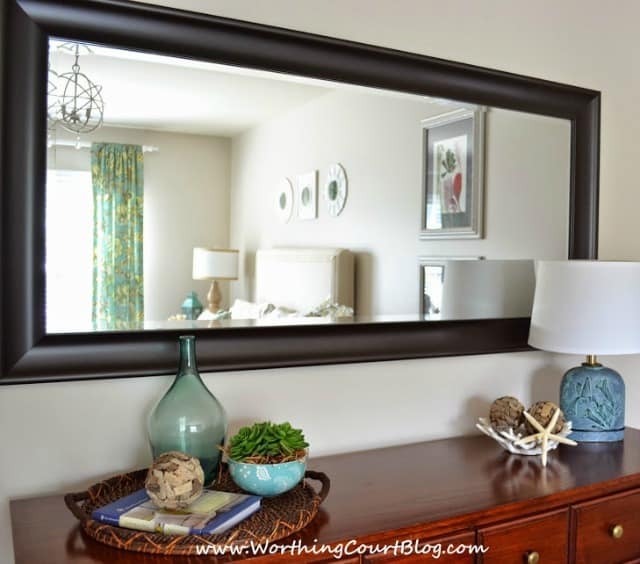 I chose to place a dresser on the wall opposite one side of the bed and added an oversize mirror to visually widen the room. It was my intention to paint the mirror and the dresser, and I still will one day, but I’ve decided to wait to see where they land in the next house. 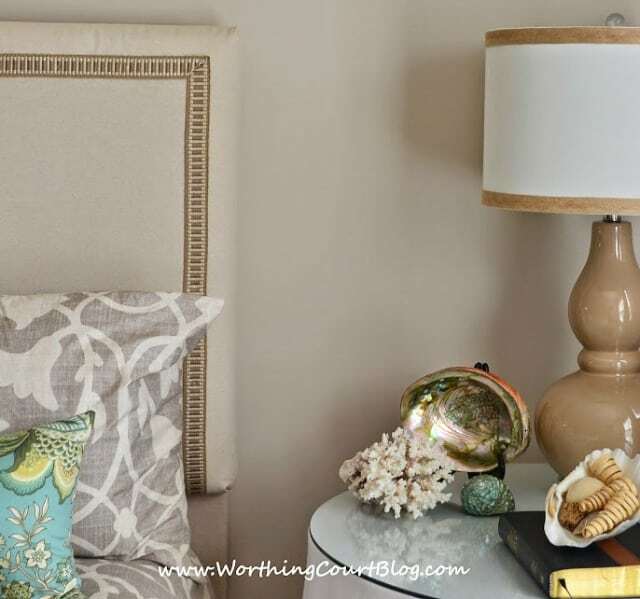 As I started adding accessories to the room, it seemed like almost everything that I chose had a beachy vibe to it. 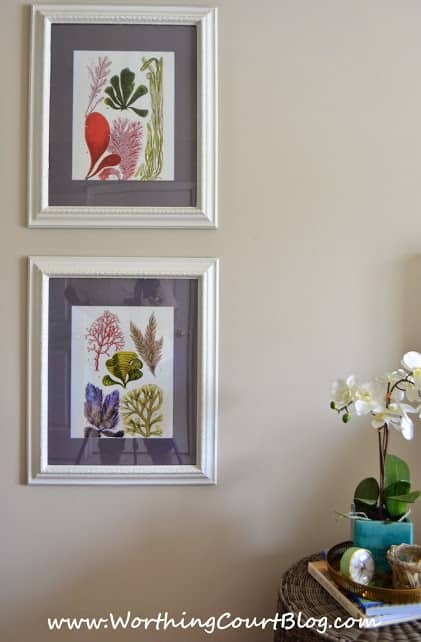 The botanical seaweed prints are framed using old, spray painted frames. The mats in these frames were originally yellow, but I carefully spray painted them gray. Yes, you can spray paint mats, just don’t spray too much paint on at one time or the paper will bubble and wrinkle. Allow the paint to dry thoroughly between coats too. 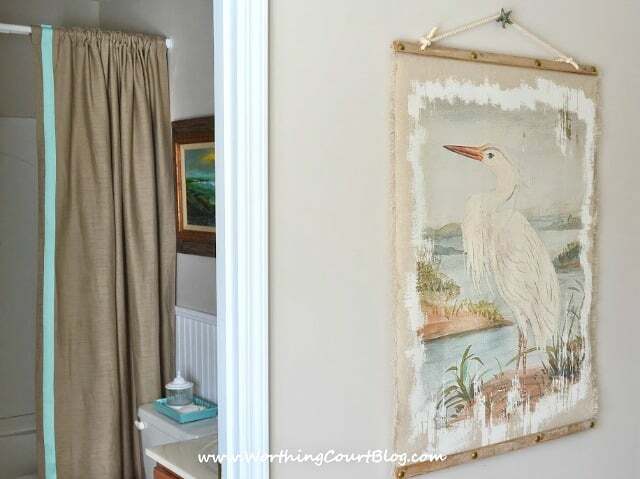 I usually don’t go for wall hangings, but I fell in love with the heron on this one, so it is hanging on the wall opposite the foot of the bed. I love the frayed edges and rope hanger. A starfish cabinet knob works great as a hanger. You can see that this bedroom has an attached bath. I’ll show it to you another day. 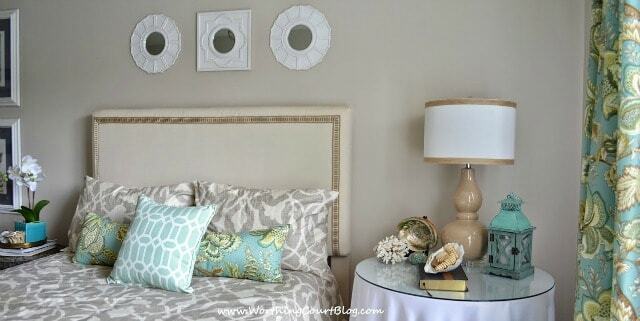 Another easy diy project in this room are the mirrors hanging above the bed. They are simply two different shaped ceiling medallions that I spray painted white and hot-glued a craft mirror to. 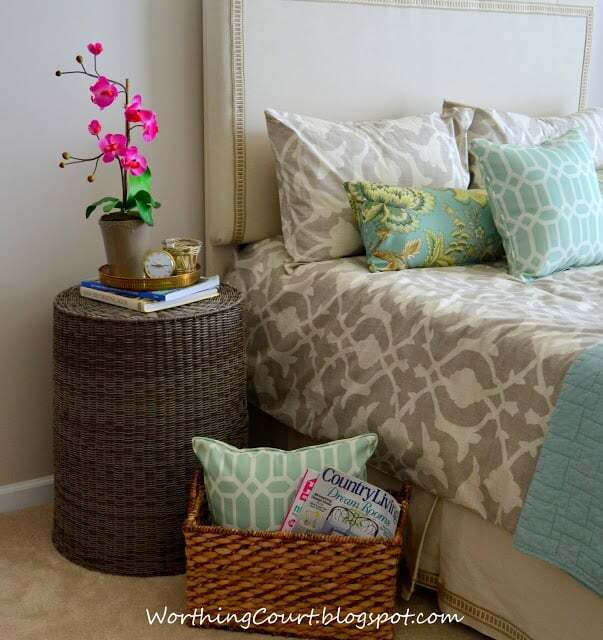 The bedskirt is made out of a drop cloth too and embellished with the same trim as the headboard. You can see that I’ve switched out the orchid from when this photo was originally taken. I’m in love with this serene room. I hope that my guests always find it to be an oasis of calm. I love your fabric choices! The drapery material is absolutely wonderful! What a great room you have put together! Thank you, Pat. I still love that fabric today as much as when I bought it several years ago. Happy July 4th! Beautiful!!! I’m certain your guests love staying in this room. 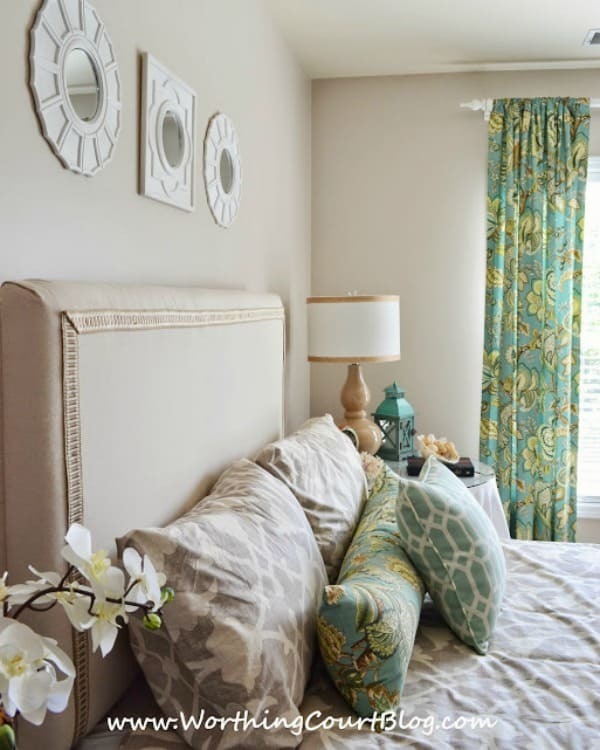 Love your idea for the ceiling medallion mirrors and your mix of all the fabrics. What type of glue did you use on the lamp shade? I love the colors, so refreshing! A comfy cozy guest room! Thanks for sharing at Inspiration Monday! Wow, I am loving those fabrics and the headboard. The trim really amps it up! Beautiful room…. Thank you, Christine. I’m always amazed by what a difference adding just a little bit of trim can make. You’re so talented, Colleen, that I’m sure you would do a fantastic job! Please shoot me a picture if you do decide to use this piece for inspiration. I love the wall hanging. Can you please share where you got it? Hi Jane. I got it at Kirkland’s. Have a great day! Love this! I especially like the shower curtain. I’m so jealous! I really want to finish my bedroom, but I need to get that kitchen done first. You did a great job! It’s gorgeous. Thank you, so much Korilynn. Good luck with your kitchen! Suzy your guests will never want to leave…so pretty!! Oh I want to come stay over! It’s a lovely room and the vibrant curtain fabric is my favorite. Thanks so much for sharing on Show-Licious! Pinning! This room is so beautiful! I am inspired by your ability to so simply and beautifully create this space for others to enjoy! I know they will be blessed! Could you share about the bedspread? It’s the perfect accent to your other details! I love it! And I love your room! Thank you! I’m so happy that you like my room, Lucy! The bedding is a duvet cover from Bed, Bath & Beyond. It’s the Barbara Barry Poetical Duvet. I don’t know if it’s still in their stores, but it is on their website. Suzy your guest room is wonderful. I am not sure how I missed it when you posted but it really caught my eye when it scrolled across your header. All the details are so well done and you have even provided your guests with reading material. Can I come for the weekend? Just kidding. Awww, Traci – you’re so sweet! Come for a visit anytime! Suzy – love the room – my favorite colors. What is the wall color? Thank you, Terry. So glad you like the room! The wall color is Sherwin Williams, 6078, Realist Beige. 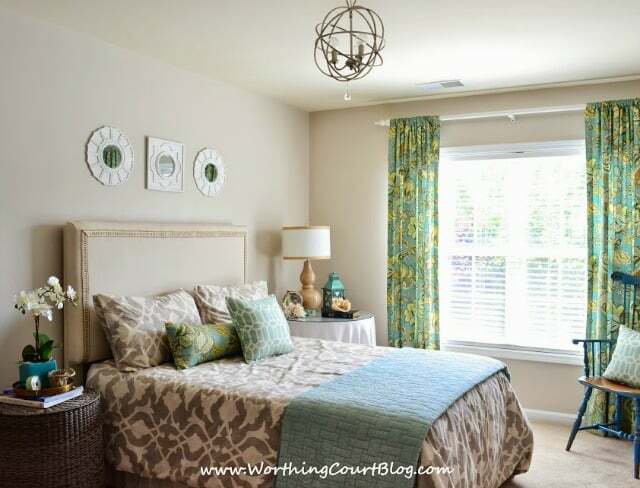 Your bedrooms are so inviting! I want to try making a headboard! Where did you get the rustic light fixture? Love the room! Where we the ocean items pictures from? Thank you, Barbara! I found the seaweed prints at Art.com. Here’s the link to one of them: https://fave.co/2o7DS9v . And here’s the link to the other one: https://fave.co/2o8znLW .